Today is Day 11 of the Money Saving Mom Early To Rise Challenge! This morning we were challenged to essentially be a blessing to others. We've taken the time to prepare ourselves for the day and now we can give of ourselves, maybe by just a gentle word or a thoughtful action. I think it's true that when you invest in time for yourself you do have more energy and drive to bless others around you. I know as I've grown in Christ, I've tried to make it a point to give others the benefit of the doubt first, and be understanding when a situation arises. I'm trying to have that mindset too with the kids. It can be so hard to remember sometimes when our human nature wants to take over and be snarky, but we are told to be on guard for these kinds of instances, and so much more in Romans 12:2. Sometimes, I try to remember by asking myself how I would react if I could see Jesus standing before me, watching me ('cause He is!). Would I let my humanness take over? Or would I choose to be a blessing to others because I feel filled up myself, whether by the Word, or having spent time in prayer, singing a worship song (or 3!) or watching the sun rise and praising God? These are all things I would probably miss or feel rushed through if I didn't take the time to get up early and give myself time to get to. So my question to you is...How will you be a blessing to others today? What time did I get up?? Accidentally took this with the flash on. Oops. 5:45 am, not too bad. D-baby does NOT want to sleep anywhere but with Mama and Daddy, so last night was a struggle for us to get him to sleep in his bed. He cried for an hour, and would get up every few minutes or so for about 20 minutes until he was too tuckered to fight his sleep anymore. As of now he's slept for 6 hours straight. This will be the last post for the week. When we pick up next week, our family will be in Georgia! I'm super excited to blog from down there. I'm planning on continuing with the ETRC, but we'll see how that goes with timezones being off. Tomorrow I'm hoping to do a post on D-baby's 1st birthday party! See you then! Today is Day 10 of the Money Saving Mom Early to Rise Challenge! This morning went over what times you are most awake and available to take on the day. I totally agree with what the author is saying. 4:30 is often my crash (and BURN!) time. Taking on the time to wake up and get going on my day early has helped me set up my schedule and prep me to get the hard things I need to accomplish first. I've seen a major difference in how effective I can be when I wake up early vs. fighting to wake up when the kids alarm goes off. So, what time did I wake up this morning? YAY! A decent time, technically a little earlier since I had to search the house for the camera. How do you feel your effectiveness changes when you get up early vs. when you don't? This is Day 9 of the Money Saving Mom Early to Rise Challenge! This day is gonna be super short and sweet. I did get up early, but only had a little bit of time to do what I wanted to for the morning. Which was exactly what the book talks about this morning! Ha! Thankfully I followed the action tip the author had for today and did my Bible study for the morning instead of blogging! This is Day 7 of the Money Saving Mom Early to Rise Challenge! Today's passage talked about something so fitting. Because today, I almost didn't get up. When you get down to the nitty gritty, a habit is based on one decision, at one point in time, resulting in one action I set only one person (myself!) responsible for. One. I am the only one who can get myself up. The only one who is controlling this. And the only one who is responsible if I don't get up. This morning, I almost made one decision that would have lead me to not be awake and typing right now. Even though I had stayed up realllllllly late to get something done that probably would have taken me 1/8 of the time had I waited til the morning. Even though I was kicking myself for choosing to stay up when I knew I shouldn't. And how I knew Fredrika would be kicking my hiney out of bed when she started blaring at 5:30 am on.the.dot. Thankfully, I did not make that decision. Because that one decision could have easily been the start of my demise with this challenge. And I do not want to let myself go down that path. 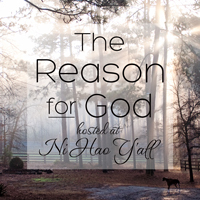 On top of that, this blog, and those who read it, are holding me accountable. Thank you for that. Choosing to make this ETR thing a habit??? Gonna do that instead, ONE morning at a time. So, what time did I finally make it up today? This is Day 6 of the Money Saving Mom Early to Rise Challenge! This morning we talked about attitude adjustment. This is one area I need so much help with. When I used to get up early to exercise, I would always feel a bit of irritation when one of the kids got up earlier than I anticipated them to. I still have throughout this challenge. But adjusting my attitude and seeing it as a gift to spend a little extra time with them will drastically change the way I see the situation. This is something I'll need practice on! Waking up on time is so refreshing! It was one of those nights that seemed to go by very quickly, but the baby stayed asleep all night! Praise the Lord! Since I'm doing the challenge only on weekdays, this will be the last post until next Monday on the ETR Challenge. This is Day 5 of the Money Saving Mom Early to Rise Challenge! This morning's passage talked about challenges. I know we all have challenges in our every day lives, but sometimes for me it's hard to pinpoint the challenges I face. Of course, there are big things like high school and college, and challenges you overcome as a couple in your marriage. But for me it seems every time I set out to challenge myself on something, I forget about it 2 days in or fail miserably. This is one of the first times I've ever stuck with a challenge I've imposed on myself for so long, and felt successful about it, so far! That's a big thing for me! So, what time did I get up?? The kitchen clock says 5:17 am....but really....it was 4:30 am. D-baby was at it again with Fredrika. They're in a race to see who could wake up mama first again and D-baby won. I was up for half an hour rocking him back to sleep when the Hubs came in and took over. Instead of going back to sleep I had to get up anyway and get this done. It was a worthwhile project for my Renew group at Lenexa Baptist Church. These early mornings are sometimes helpful, but I was not planning on getting up at 4:30! We're at Day 4 of the Money Saving Mom Early to Rise Challenge. This morning's passage was about focusing on things you can control and not dwelling on things you can't control. This is sometimes a struggle for me and has been for awhile. The author talks about not focusing on who else gets up in the morning, interrupting your quiet time. I'll admit it, that is something that irritates me the most. I have to learn to be interrupt-able. Yesterday's action tip was to buy slippers and tweet a picture of them. Unfortunately, I don't tweet, so I thought I'd let you guys see them. Pretty cute and very comfy! I'm still working on the "going to bed early" part of this challenge. It's still a struggle for me, but seems to be getting easier already. I think with my Graves and the subsequent bad habits that followed, I trained a decent bed time out of my lifestyle. Now it's time to do the work to train it back in. Last night I went to bed around 11:30. Pretty late still, but it's no 12 midnight, or 1 am. I'm working on making this time earlier and earlier until I can get it up to 10-10:30. The Hubs will be ecstatic! I also need to incorporate the "listen to/ read something incouraging" and the "have something planned" parts into my bed time routine. I think that would make it a bit easier to get into the bed and hopefully fall asleep quickly there after. And Praise the Lord, D-baby stayed asleep the WHOLE NIGHT! He tried to get up twice, but the Hubs was able to get him back to sleep fairly easily. WOOT! Thanks so much for staying with me this far! This is Day 3 of the Money Saving Mom Early to Rise Challenge! Today's passage covered "Being Selfish at 5 am". I have to say I'm starting to change my perspective on how my day was laid out and am starting to see how this is essential to the success of this challenge. Before beginning this challenge, I believed that I was a night person. To some extent I do seem to be. After the kids went to bed I would declare it "Mama time" and would spend the rest of the night "unwinding" from the day. I would tell Hubs that there was so much work to get done and I wanted to stay awake to finish it. Problem is I would end up stay up "unwinding" WAY too late (1-2 am! YIKES!) or I wouldn't get done what I declared MUST be done before I went to bed. I've been observing myself the past few weeks and found that when Hubs comes home from work, very little gets done around the house. I used to think I could pick back up on the day's chores after the kids went to bed, but always ended up wanting to spend that time with the Hubs. And then it would come time for us to go to bed and I'd always want to spend that time "unwiding" a little longer. That is where my downfall was. 3. Spend time with hubby/ go to bed! No more thinking I'm going to be motivated to go back to chores, no more trying to just get "one more thing done". I'm declaring my time for "Being Selfish" to no longer be at 11,12, 1 or 2 am! My time for Mama time will be 5:30 am! This is actually false. D-baby decided he would beat Fredrika to the punch and woke mama up at 5:15am. Knowing I had only 15 minutes before my alarm went off I tried to put him back to sleep, but to no avail. He knew what was up and REFUSED. 5:15 is too early for him to start thinking it's ok to be awake (and it's MAMA's time, right?!) so I decided to lay down with him til he was calm, and then let the Hubs take over so I could start my day. This is when I was able to crawl out of bed without waking D-baby. Hubs didn't mind. He got to cuddle in a warm bed with a little love! In every plan includes a wrench, I guess. Going with the flow is still something I'm learning to be ok with. Le sigh. There's always tomorrow! I'm still declaring this morning a success. This morning is Day 2 of the challenge, and so far, it's going pretty well. My Sunday night was a little wonky going to bed and staying asleep. D-Baby was awake twice before 2 am and then woke again just now as I'm typing this. It's 5:56 am. I've got a feeling he'll be a factor in how easily it is for me to wake up. We're trying to get him to stay asleep in his own bed instead of needing mama or daddy to lay down with him. I really appreciated the day's writing. I've never thought to name my alarm clock, and suspect Hubs to think I'm crazy when I tell it "Good Morning" tomorrow. That's ok. I do expect this to get harder as it goes. I expect myself to fail a few mornings. But I'm doing what I need to to avoid setting myself up for failure. I'm also still trying to figure out how my mornings should look. Bible study and devotions, exercise and blogging are at the top of my list. Any suggestions on how I should approach this? I think that's something I'll be tackling this morning. It's March, I get it. By now you should know I blog pretty inconsistently around here, something I'd like to change. It seems I'm always trying to change something...organizationally, consistency. Well, this time it's what time I wake up. 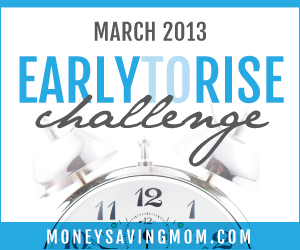 I've joined Money Saving Mom's Early To Rise Challenge for March. Yay! I must say, we've been working hard around here as a family to get some things changed, including bedtime/wake up time. It's been hard, but nothing worth doing is easy. Consistency is our biggest monster to tackle. Nights are when I traditionally unwind and have some me time. Unfortunately, I end up going to bed really late and can barely wake up when the kids do the next morning. A while ago, I tried to implement a bed time strategy, focusing on consistency, but eventually it got to be too much for me to handle alone. Wrangling three kids into bed is no easy task. You see, Hubs has one of those jobs with an inconsistent time where he leaves work, and there were nights he just wasn't able to make it before the bedtime routine was started. So I thought, what could I do personally that would change the way I handle things in the morning? Now, please note, this is my daughter's alarm clock. She ended up sleeping for a little while in our bed after a bad dream. I didn't think it was a good idea to wake her with random camera flashes. :( But it does say 5:33 am! My goal was 5:30 am. And I'm pretty proud of myself! Why? Because I woke up at 5:15 with no alarm clock! Yay! And, I thought for sure I was going to fail this morning, because I'm also sick. :( Last night I came down with the chills, body aches, all the wonderful benefits of the flu. My fourth round this winter. Amazing, because I NEVER get the flu. This morning, it woke me up with a fever again. So in all honesty, I'll probably be going back to sleep here soon. At least I made it this far. Baby steps, right?